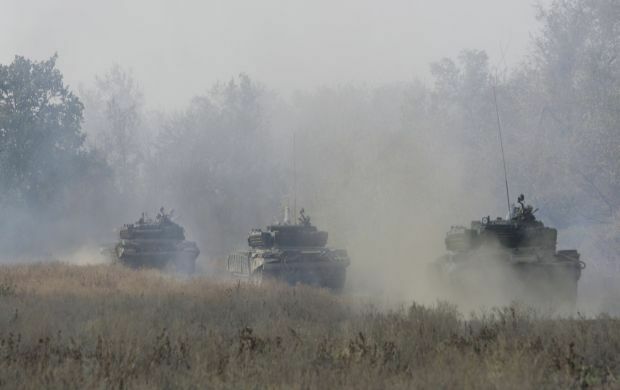 The combined Russian-separatist forces attacked Ukrainian army positions in eastern Ukraine 59 times overnight, the press center of the Anti-Terrorist Operation (ATO) wrote on Facebook early Saturday. "The situation in the Donbas conflict zone remains tense. Around noon on December 18, the pro-Russian illegal armed groups fired Grad multiple rocket launchers twice on ATO forces. They launched seven unguided rocket missiles on the Ukrainian defenders near the village of Troyitske in Luhansk region," the press center said. The intensity of armed provocations by the Russian-backed hybrid gangs increased significantly in the evening. From 18:00 until now, the Ukrainian armed forces have recorded 40 attacks in the direction of their fortified positions, while six of them were carried out after midnight. The militants fired 82mm mortars twice in the direction of the village of Zaitseve and the town of Krasnohorivka. In addition, the Ukrainian positions near the towns of Maryinka and Krasnohorivka were under intense fire from the small arms, rocket-propelled grenades, heavy machine guns and anti-aircraft guns. For the sake of their own lives and safety of local residents, the Ukrainian soldiers were forced to open fire in response from the allowed weapons, after which the invaders stopped firing. In addition, not far from the temporarily occupied city of Donetsk, the militants fired small arms and rocket-propelled grenades on the Ukrainian positions near the town of Avdiyivka and the village of Pisky. The pro-Kremlin militants also fired the same type of weapons on the villages of Mayorsk, Zaitseve, Novoselivka and Novhorodske, which are located near the militant-occupied town of Horlivka. The mercenaries also fired small arms thrice on the village of Shyrokyne overnight. After midnight, the militants attacked ATO forces only in Pisky and Avdiyivka.